As Americans prepare to cast their ballots in the 2018 midterm elections, luxury brands are getting creative in their efforts to encourage a high turnout at the polls. Despite potential backlash and other repercussions, companies have become involved with both nonpartisan and partisan organizations, emphasizing how tense this United States election cycle has been. A growing number of consumers, especially millennials and members of Generation Z, seek out brands that support like-minded values, making politics another potential bridge to relationship building. "Take any brand: their message usually focuses on a life well-lived, or being a trendsetter or expressing individuality," he said. "The link to well-intentioned social commentary is weak at best." Luxury brands are using the midterm elections as an opportunity to build consumer connections while advocating for civic responsibility. Online retailer Moda Operandi urged U.S. consumers to vote in the elections with help from more than a dozen local fashion labels. 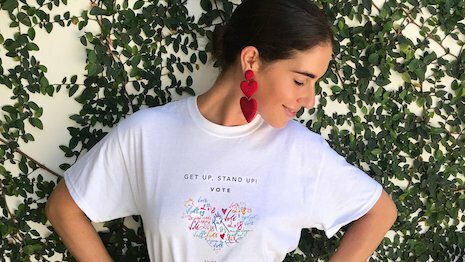 Thirteen designers, including Carolina Herrera and Tory Burch, created nonpartisan T-shirts for Rock the Vote, which were sold via a limited-edition trunkshow on Moda Operandi (see story). 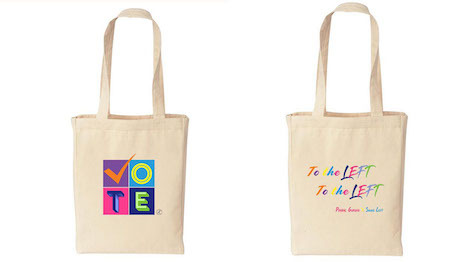 Some of those same designers, including Cynthia Rowley and Prabal Gurung, also created tote bags inspired by voter canvassing in a collaboration with Swing Left. The grassroots organization is working to achieve a Democratic majority in the U.S. House of Representatives. Mr. Gurung's design features the phrase "To the left, to the left." U.S.-based fashion label John Varvatos shot a still campaign on the steps of the U.S. Supreme Court and encouraged fans to register to vote. 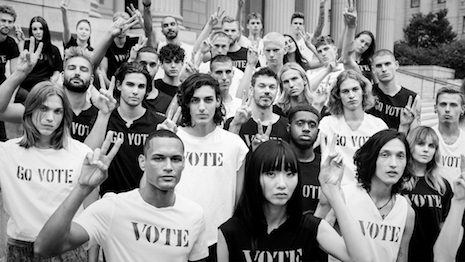 The black-and-white photographs include young men and women wearing graphic shirts with the words "Vote" or "Go Vote" and making peace signs. "Cultural relevance is so important to every brand we talk to, and they always want to integrate their brand within culture," said Brian Salzman, founder and CEO of RQ Agency, Hollywood. "Right now, there’s nothing more top-of-mind than voting, and even celebrities are getting involved, so it’s smart for brands to also spread the word." To increase voter participation, organizations involved in the nonpartisan effort Time to Vote are releasing special-edition apparel, closing offices or scheduling group trips to the polls. Department store chain Nordstrom is among the participants and reminded employees to take flextime if needed to vote. Ridesharing platform Lyft is also among the companies encouraging its employees to take time to vote. For eligible voters who face transportation issues, Lyft is also offering free and discounted rides to polling locations. "For a brand to talk about getting out the vote, it needs to be authentic," said Alex Sturtevant, global director of brand, Stink Studios, New York. "Encouraging your customer to take an hour off to stand in line? Make sure you give your own employees that hour as well." With an increasingly divisive political climate, more brands are using their public platforms to advocate their views. During recent fashion weeks, there has been political messaging both subtle and direct, from runway looks that referenced the presidential campaign to statements targeting specific policies (see story). A report from Morning Consult finds that honesty, quality and customer service are among the most important brand traits for millennials to drive loyalty. While much has been made of the impact of brands' political values on younger shoppers, this survey shows some experts may have been overemphasizing the importance of these positions on millennials' decision making. If a brand wants to share its political inclinations with millennials, the least controversial issues to support are civil rights and gay rights (see story). Nonetheless, brands that become more transparent about their politics open themselves up for criticism. "The risk is that your brand becomes aligned with a political cause, which in the best case scenario, alienates half of the people who don't agree with your political agenda," said Rob Frankel, branding strategist and expert at Frankel & Anderson, Los Angeles. "Brands are about business, not politics." Other branding experts are in agreement with Mr. Frankel. "I continue to disagree with the premise that it is important for brands to encourage people to vote," said Brandgrowth's Mr. Reffsin. "People are driven to vote because of their affinity to a candidate or a cause. "Let's be serious for a moment," he said. "How many people do you think will be driven or reminded to vote because of a brand's support?"